On January 8, 2012 I will run my very first marathon, the Walt Disney World Marathon in Orlando, FL. I know that people run marathons all the time. It has even become, it seems, the thing to do lately. Why am I running a marathon? I get asked this question all the time. The short answer is because I have done a half marathon and this seems like the logical next step. The more accurate answer is because I can. You see I am the overweight, self-conscious teen aged girl who sits on the side lines during gym class because I believe that I am too heavy to run. I proclaimed throughout my 20s that I absolutely can’t run nor will I try. In my early 30s my cousin began training for a marathon. Probably out of jealousy I said out loud that I would never run a marathon because I had better things to do with my time. At 33 years old I had my son. At 36 I ran my first 5K. At 37 I ran my first half marathon. Somewhere between 33 and 36 I decided that I was going to give running a try. It seemed the perfect form of a exercise for a busy mom who works nights and spends the daytime taking care of a very active little boy. So I began running…very very slowly at first and for only a minute or two. I am now the girl who CAN run. I have learned a few things throughout this running journey. #1 Never say never. #2 You can always go a little further. #3 You really can do anything you set your mind to. #4 I am so lucky to be able to train for a marathon. I think that it goes without saying that I am no expert on running or marathons. I have developed my marathon training plan based on Hal Higdon’s Novice 2 Marathon Training Guide. I will also have a physical exam with my primary care physician on Thursday, July 28, 2011 during Week 2 of my training to determine my baseline health at the start of training. 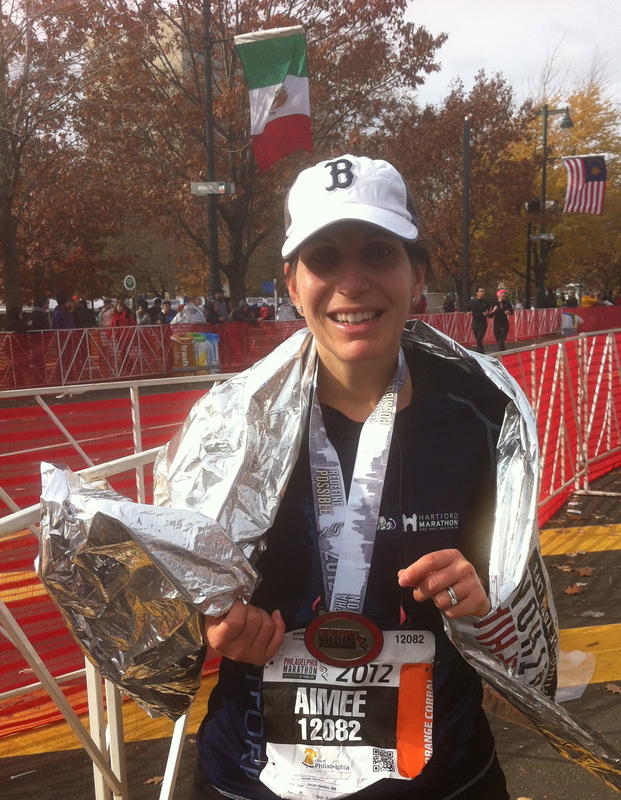 Below I will link to the posts wrapping up each week of marathon training and eventually my race recaps. If anyone reads this and has any questions for me or just wants to share their marathon training experiences please either leave a comment or email me at aimeer828@gmail.com. Thanks so much for visiting.